Even so, it was probably not the best time to have taken that trade since risk aversion has been on a roll for the entire week. Could this be a late reaction to the earthquake and nuclear problems in Japan? So how could I have played this trade better? In retrospect, I could’ve taken the reverse side of this trade when I saw that it broke out of the falling trend line on the 4-hour chart. I should’ve taken my cue from that strong safe-haven rally during the Asian session and took a pro-USD trade for the day. But since I’m not too comfortable with breakout trades, I could’ve waited for the break then retest. Had I gone long at the pullback to .9800, I probably would’ve made around 150 pips by now. Shorted USD/CAD at .9800, stopped out at .9900. I’m feeling bummed out that I suffered another losing trade and that my account is back in the red again. It’s a pity my usual TV shows aren’t doing the trick in cheering me up this week. I think I could use a pick-me-up this weekend. Do you have any suggestions? And pretty please don’t say Rebecca Black’s “Friday”? That song has been stuck in my head for days already! This is it folks! 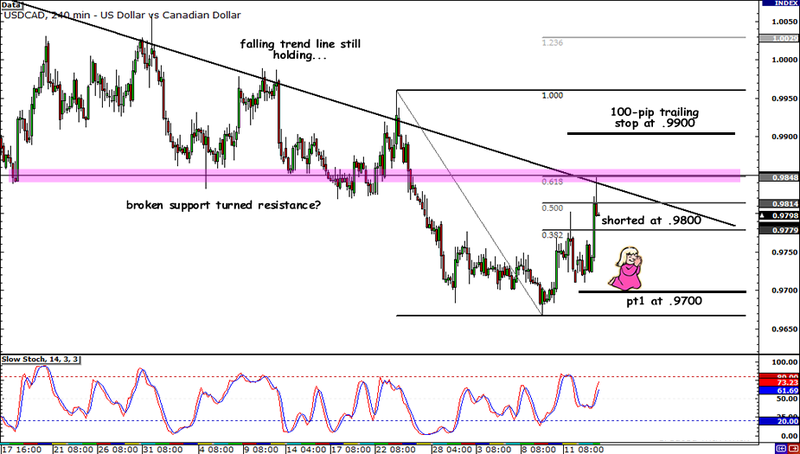 This is the USD/CAD setup I’ve been watching for the longest time and now’s my chance to take it. Is the setup as perfect as I imagined? There’s a falling trend line connecting the pair’s highs, confirming that the downtrend I spotted a few days ago is still intact. I drew the Fib tool on the recent drop and noticed that the 61.8% Fibonacci retracement level lines up perfectly with the former support at .9850. Knowing how USD/CAD usually respects broken support or resistance levels, I suspect that .9850 would hold as resistance this time around. Besides, that area is just right smack on the descending trend line itself. That’s the Fib + resistance + trend line trifecta right there! Anyway, when that candlestick finally closed as a long-wicked bearish one, I took that as a signal to pull the trigger and short at market (.9800). Although I missed out on a few pips, I think it was a good enough entry because it’s right below the previous week high resistance. Pretty please hold? Aside from my pretty solid setup, I’m counting on economic events to reel me in some pips. Early this morning I heard from one of my tennis buddies that the Fed might not give strong statements in its FOMC meeting minutes today, especially when recent events like unrest in the Middle East and Japan’s earthquake are rocking global economy. I let him win this morning’s game, so I hope he’s telling the truth! Aside from the FOMC minutes, I’m expecting risk aversion in markets to ease up a bit after yesterday’s selloff in commodity-related currencies. Heck, my poor Loonie got left out even after oil prices recovered from its drop! I’m crossing my fingers that markets give some love for the Loonie today. 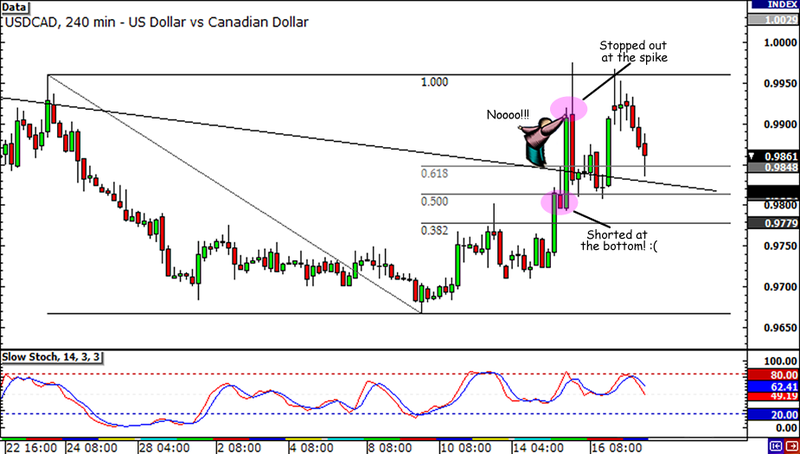 Short USD/CAD at market (.9800), 100-pip trailing stop initially at .9900, pt1 at .9700. I plan to let the rest of my position ride after my first target gets hit. Who knows if those recent lows around .9680 would break? As always, I risked 1% of my account on this one. Wish me luck! Or if you want you could hum the Hayley Williams song with me on my Twitter account!